The arrested person was identified as Lalhming Thanga (42) of Zoveng, Zenhang Lamka Churachandpur. The WY tablets seized in Imphal by Customs officials. Image: Northeast Now. 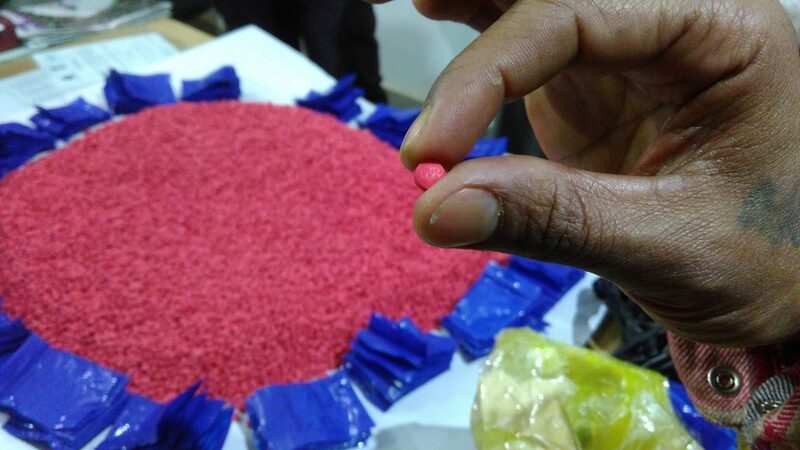 Acting on a specific information the anti-smuggling unit of customs division based in Imphal seized around 50,000 amphetamine tablets also known as WY (World is Yours) tablets from the possession of one person from Churachandpur, according to Customs officials in Imphal. He was arrested at Chingmeirong near Manipur Baptist Church in Imphal while he was trying to deliver the contraband drugs to some other person, the officials said. The total value of the contraband drugs is estimated at Rs 5 crores in the international market, officials added. The seized contraband drugs, reportedly known as party drug, was also displayed before the media persons in Imphal on Friday. Later Assistant Commissioner Modoli Daso of Customs division, Imphal, in a press release informed that a case had been registered under NDPS (Narcotic Drugs and Psychotropic Substances) Act. Further investigation is on to nab other person(s) involved, he said. In September last year, the Customs Preventive Force of Moreh in Manipur under the supervision of its Superintendent arrested an individual along with Rs 3 crore worth of WY tablets from Chikim Veng, near Moreh oil pump, along Asian Highway Imphal-Moreh road.